Does Wheel Size Affect Sizing? Is a Bike Wheel Size Chart Needed? When you are new to cycling the first question you ask yourself is “What size bike do I need?”. It is not a complex question, but it is one that can cause a lot of fear and sleepless nights! There seem to be a million bike frame sizes. There is a lot of advice, so we have decided to bring it all here for you in a simple format with a handy bike size chart to help guide you. Our easy-to-read size chart will show you the bike size options for your height. We will then give you a rundown on a few simple tips to help ease your mind about bike frame size. Finally, we will break down some myths and give you real information so you can go into any shop and know what you are being told is true — not just a sales pitch. The simplest way to find out if a bike is the correct size for you is to look at our handy bike frame size charts. We have broken these down into the various types of bike available. Mountain bike sizing can be affected by suspension and your tire choices. So, make sure you look at a tire size chart and try a full-suspension mountain bike for size before buying. For standard hardtails, our mountain bike size chart should be a god send. A hybrid is your fastest way around town and you’ll find their sizes sit in-between road bike and mountain bike sizing. We have set this hybrid bike size chart in inches as it is the most common way to buy hybrid bikes, some fast models will be measured in centimeters like road bikes. If you want to get rad down at the skatepark or race track, this is a quick guide to getting the correct BMX size. BMX, unlike other bike sizes, can be changed by preference. The size will not biomechanically impede on you. What you will see in these charts is that adult bikes are generally measured by their bicycle frame size. Wheel size is a very important metric if you are a child because you need to be able to stand over your bike if you want to ride it, and wheels that are too big won’t let you do that. On road bikes and hybrids, no, as these bikes will all have a similarly sized wheel. However, on a mountain bike, the answer is yes. Mountains bikes now come in three different wheel sizes. You can find them with 26” wheels, 27.5” wheels, or 29” wheels. If all three have a 15” frame, there will be a height difference between them due to their wheel size. Bike frames are measured from the middle of their bottom bracket to the end of their seat tube. Your wheel axle height sets your bottom bracket height. If we take the 26” wheel as the base height, the axle height for a 27.5” wheel will be 0.75” higher. If we then look at the 29” wheel, its axle will be 1.5” higher. This is because the axle sits in the middle of your wheel. We then divide the difference in wheel height by half to get information on how much higher the axle sits. A 15” frame will be 15.75” on a 27.5” or 16.5” on a 29”. Some manufacturers have worked on the mathematics and geometry to keep the differences closer than this. Others have not.The good news is, we have the option of knowing stack and reach, and this will tell us how close the fit is for you. We have more on stack and reach below. You might not believe it, but the charts above also work for women. They are all the perfect women’s bike sizes. We have been fed so many tales about how women need specific bikes and kits. We have all heard the stories of women having a smaller torso than men, therefore needing smaller top tubes. If you take a woman and a man of the same height, the man will have longer legs, and the women will have a longer torso. The myth is purely anecdotal and is not helped by high heels and the cut of women’s trousers. It is a prevalent myth, and one that needs to die. There are references below if you want to know more. The secret to a women’s fit is a women’s specific saddle. There is a caveat to this though: 10% of women have a pelvis shaped like a man’s pelvis. 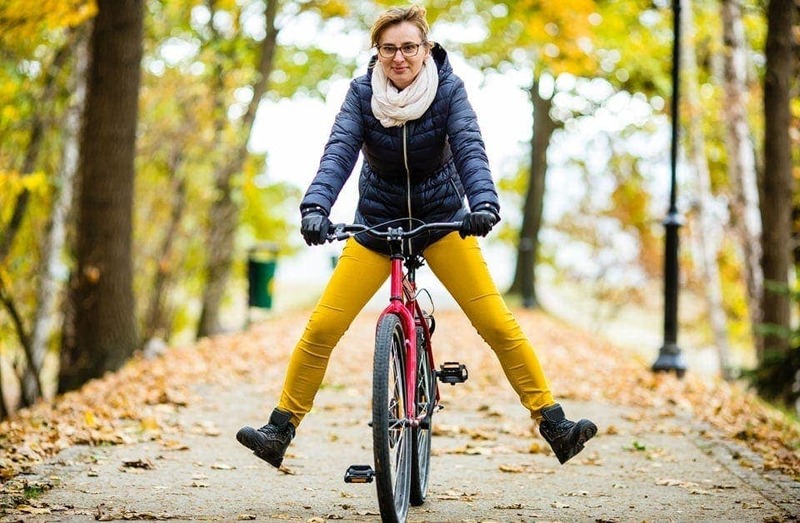 What women need is a bike that fits, so don’t be taken in by the “shrink it and pink it” marketing. Trek, for instance, has sizing charts that don’t change due to gender, but they do pink bikes with a women’s specific saddle. The bicycle size charts are not the end of the story. You can further dial your bike fit and size needed by knowing how to calculate your bike’s saddle height. Your saddle height is the most important contact point that you have with your bike. Getting the right sized bike for your child does not need to be a complicated process. We think this topic needs its own post so we wrote this kids bike size chart article that covers all aspects. Measuring your inseam is pretty easy, and it is the first step in how to measure yourself for a bike. You will need four things: a hardback book, a tape measurer, a friend, and yourself. Stand with your back against the wall, as flat as possible and with no shoes or socks. Take your book and run it up to the top of your inner legs. Get your friend to measure from the top of the book to the floor. You have your inseam length, and it will more than likely not be the same as your trouser leg measurement. These steps will not only allow you to calculate your frame size, they will also allow you to measure your saddle height. The Greg LeMond method has been shown to be pretty accurate here. What you do is take your inseam measurement in centimeters and multiply it by 0.833. You then take this measurement and go up your bike’s seat tube with your tape. Once you have reached the magic number, this is where the top of your saddle should be. The number for your saddle height is one of the most critical metrics for bike sizing and fit. You can then use your inseam to calculate frame size by using some sums, or you can use one of the various online bike fit calculators. If you want to know the sums then to find your road bike frame size, take your inseam length in centimeters and multiply it by 0.70. For a hybrid bike, take your inseam and multiply it by 0.69. For mountain bikes, take the same measurement and multiply 0.6, you will then need to change the centimeters into inches. The calculation here will give you your bike’s frame size. Bike frame sizes are measured in the same way for all styles of bicycle. To measure your bike’s frame size, take a measuring tape and place the tape in the center bolt of your bike’s cranks. If it is just the frame, this will be the center point in the bottom bracket shell. Now run the measuring tape up your seat tube. When you reach the end of the seat tube, you have your frame size. It is fairly simple. When searching online for advice about bike sizing, you will come across bike fit calculators. The simplest bike size calculators will use your height and inseam length. The frame size they give you will then just be taken from the bike size charts we have posted above. The more complicated versions of this calculator will ask a lot of questions, including such questions as “what is your arm length?” To measure your arm length, you will need your friend and tape measure again. Stand straight, with one arm out to your side level with your shoulder. Get your friend to measure from the start of your collarbone to the middle of your clenched fist. The measurement you have just taken will be your reach. You will see many manufacturers now quote their bike’s size in stack and reach. Some will even have stack and reach on their bikes instead of frame size stickers. Your stack is the distance from the center point of your bottom bracket to the center point at the top of your bike frame’s headtube. Your reach is the horizontal version of this distance. It is a much more technical bike sizing method, but it is slowly becoming the preferred method, especially amongst higher end bikes. Stack and reach is the perfect number for how to determine bike size. As a rule, if you sit between two sizes on a road or hybrid bike, go smaller. For a mountain bike, go larger. That will make any future part changes easier. 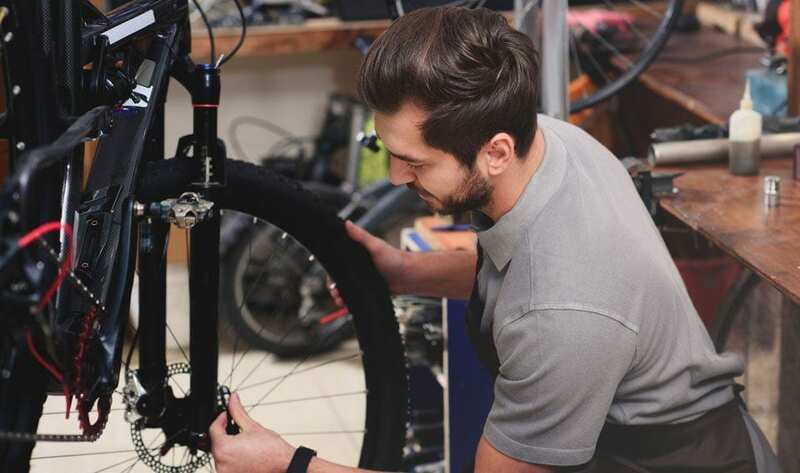 Your bike comes made from many parts, and all of these parts can be changed to make a bike fit you better. One of the key ways to know if you have a problem is to listen to your body. There is an old cycling rule that knee pain at the back of your leg means your saddle is too high. If you are having pain in the front of your knee, then your saddle is too low. You will find that road cyclists generally have their seat too high. As with all rules, remember that these are just guides and not gospel. When you are setting your saddle height always remember that you can change seat posts. Some seat posts supplied may be too small, and some may be too long. If your seat post is too short, it is a trip to a bike shop to sort the issue. If your seat post is too long, all you need to do is hack off a bit. Wear a mask if you’re cutting carbon fiber. If you feel the reach is too much or too cramped to your handlebars, then you can move your saddle forward or backward. Look at your saddle rails, as they will have maximum lines for movement. Going beyond these lines will likely cause your saddle to snap. If you need to go beyond these lines, it might be worth changing your stem. You can change your stem to either a longer or a shorter stem. There will be an effect on the way your bike handles, though. A shorter stem will make your bike feel twitchier, and a longer stem will make your bike feel more lethargic.